Malachi is an Australian and emigrated to the UK in 1998. In London, he has worked as Head Chef at The Mango Tree in Belgravia, Helter Skelter in Brixton and Cocoon in Regent Street, as well as spending three years in the yachting industry as a private chef. Malachi joined Corbin & King in late 2011 as Executive Sous Chef for the opening of The Delaunay. Four years later he was promoted to Group Executive Chef, a role which he upholds today whilst remaining at the helm of The Delaunay kitchen. 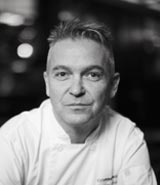 Regis started his career in France working in boulangeries, patisseries and Michelin-starred restaurants. He has worked extensively throughout the world in Lausanne, Milan, Mauritius, Frankfurt, Seoul and Beijing working for the Forte, Hilton and Kempinski groups. 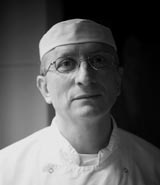 In August 2005, Regis joined Corbin & King as Head Pastry Chef for The Wolseley. He is now based at The Delaunay in the same role and has since established the Pastry team for the Group, too. Gary began his career in Hospitality Engineering over 25 years ago. He started as a Shift Engineer with Holiday Inn Hotels where he stayed for eleven years, leaving as Chief Engineer. Following that, he opened hotels with Rocco Forte in Cardiff and with the Levy Brothers at The Grove in Hertfordshire. After working in London for a number of years, he gained overseas experience in the Caribbean before moving to the Middle East where he stayed for seven years working in both Bahrain and Dubai. 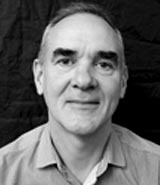 Gary returned to London in 2016 and worked for Melia Hotels, managing their Engineering / Projects throughout the UK until September 2018 when he joined Corbin & King as the Group's Chief Engineer.